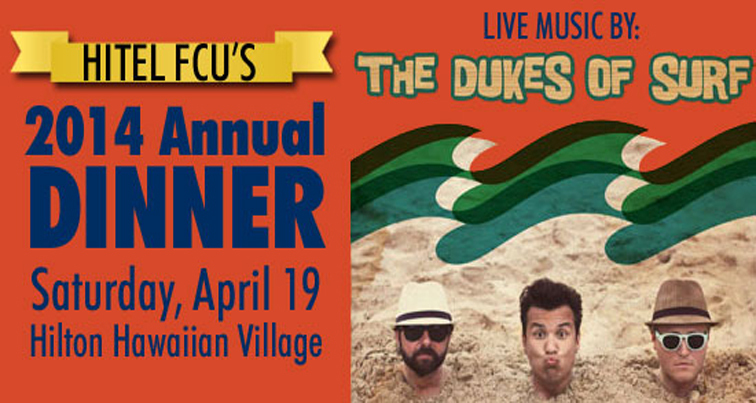 HiTel FCU’s Annual Meeting and Dinner will be held on Saturday April 19, 2014 at the Hilton Hawaiian Village Coral Ballroom. Tickets will only be sold at the King Street Branch from Friday, February 14th until Friday, March 28th. Members who purchase a full table of ten will get a complimentary Hilton HawaiianVillage parking pass for that evening. The meeting will begin promptly at 5:00pm and dinner to follow at 6:00pm. Ticket prices are $25 per member and $40 per non-member. All forms will be processed as soon as they are received so don’t wait! Visit our website at hitelfcu.com to print out a form – fax, mail or bring it into any of our branches. This entry was posted in CU News and tagged annual dinner, Annual Meeting, Bishop Street, credit union, Downtown, ewa beach, fax, finance, Halekulani, hawaii, hawaiian tel fcu, Hilton Hawaiian Village Waikiki Beach Resort, hitelfcu, honolulu, Kaimuki, Kalihi, Kapalama, kapolei, King, kunia, mail, mccully, members, mililani, new accounts, nonmembers, print, sale, Schofield, The Dukes of Surf, tickets, Wahiawa, Waikiki, waipahu, walk in, Wheeler AAF by Hawaiian Financial Federal Credit Union. Bookmark the permalink.